Many people ask me what it takes to create a great landscape design. First, you need to consider what you want to do with your space. How much time will you spend in your yard? What do you want to use your landscape for? Are you simply creating a stunning visual or do you want to create a living space? 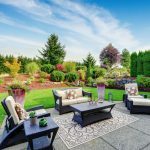 Setting these variables aside, there are a few basic tips you can follow to turn your backyard into a relaxing retreat. Invest in a great landscape plan for a low maintenance garden. Having a proper landscape design from the start is essential to creating a landscape that works for you. 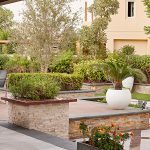 While you can opt to research personally to design your space, many individuals prefer to consult a professional, to help design a sustainable garden that will work for their life, such as the experts at Milestone. Regardless of your design theme, be sure to include plants that last in all seasons and are perennial. The goal is to have flowering,fruiting,palm family trees and shrubs that last through the year minimizing frequent replacements. Be sure to incorporate drought tolerant plants, automatic and water efficient irrigation systems, lawn alternatives, rock gardens for low maintenance, and mulch/stone to reduce weed growth in your design. Ultimately, a well-designed landscape will dramatically cut your energy costs. Create layering in your planting beds. Plan your planting beds to have at least three rows of plants. Plant the tallest plants in the back row, medium height plants in the middle row, and reserve the front row for ground cover or shorter plants. Be sure to incorporate some unique shrubs or bushes to add additional visual appeal of your garden beds. Remember to use the principles of repetition, both in the planting bed and elsewhere in your yard. This will lend a bit of structure to the freedom of your overall design. Trees may be planted in between at every 4 meter distance and at least a meter away from the Villa boundary walls to avoid the growth of roots damaging the boundary footings. Incorporate hardscape into your landscape design. Whether you are creating pathways, patios, retaining walls or outdoor living spaces, your hardscape material should always be constructed from the same type of matching materials. The right hardscape will tie all your landscape items together, creating a space that flows throughout the landscape design. For added interest, try incorporating walkways with stepping stones set within pebbles or with decorative ground covers. Outdoor kitchens and living spaces. If you plan on spending a significant amount of time in your backyard you may want to consider designing an outdoor kitchen and living space. A custom designed outdoor kitchen will instantly become the new entertainment hub for your outdoor lifestyle. From intimate family dinners to neighborhood parties , your outdoor living space will become a household favorite. For extra appeal you can add a fire pit, fireline, pool house, Pergola, BBq and much more! With just a few additions you can design a backyard that’s perfect for entertaining family and friends. Invest in good soil and effective mulch. Exceptional soil preparation and incorporating healthy organic soil and compost is perhaps one of the most critical aspects of creating and maintaining a healthy, lush looking landscape design. Additionally, add a 2-4” thick layer of mulch over layers of weed fabric to provide a barrier to keep pesky weeds at bay. Use perlite to reduce water in soil. Plant annuals and seasonal bulbs to supplement perennial color. Though Perennial flowers add a beautiful pop of color to your planting beds, they only bloom o for a particular amount of time. By incorporating annual and seasonal bulbs into your landscaping plan, you will be able to enjoy a splash of color all year round! They look fantastic and and brighten up those dreary winter months. Add statuary, pots, birdbaths, and water features to create focal points. Exceptional landscape designs are anchored by focal points. Using beautiful statues and potted plants in between beds not only creates architectural and visual interest but it also allows you to add personal taste to your design. Birdbaths will attract wildlife to your ward which only enhances your outdoor space. Water features and waterfalls are visually appealing and provide soothing sounds that will help mask unwanted noises in your neighborhood. Add a theme garden to your landscape design. This may sound redundant but adding a themed garden to your landscape will create a space within your space. 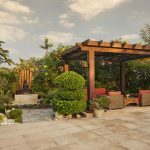 Whether you want to create a relaxing Zen garden to find your center after a stressful day at work or a Mediterranean-inspired garden to excite your senses, this added element will lend the illusion of more space in your landscape design. We all love flowers. However, you can use alternative foliage to spruce up your landscape design with a diverse variety of textures and colors. Evergreen plants, such as ficus, may lack flowers but they have foliage that offers a myriad of different textures and colors. Not to mention, not all evergreens are green! So replace plants that don’t flower with eye-catching alternatives, like pandanus, Cyerus, Pennissettum Rubrum, Haemaenocalis, Boganvillea, Ixora, Murraya Jasmine, Carissa, Raphis palm etc. You can’t go wrong with a living wall! Turn your exterior wall into a lush vertical garden! Aside from blending into your landscape design these gorgeous living walls reduce stress, enhance air quality, improve mental health, and promote sustainability. Using different types of plants will create an artistic infusion that will certainly add to your landscape design. When it comes time to create your landscape design be sure to add elements that speak to your personal tastes and life. A well-maintained landscape can add as much as 10 percent to your home’s value. 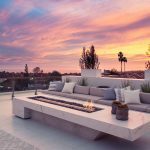 Use these tips to increase your home’s appeal and to create a relaxing landscape design that you will enjoy for years to come.